Katie is dubbed the jack-of-all-trades at Matrix Group. She's our resident tester (browsers, responsive, SSO) and manages most of the content entry and migration for client sites. She earned a degree from the University of Southern Mississippi in Sociology, and before she worked at Matrix Group, she was a professional dog trainer. In her spare time you’ll find her spending time with her husband, little girl, and two dogs. She is an avid runner and loves doing all sorts of crafting from hand lettering to chalkboards. We all live and die by the accounting department, so find out what your budget is and go from there. Honor your budget, and your time. Even the most teetotaling officemate can relax while others are enjoying a tiny cocktail. Adding St. Germane (an elderflower liquor) can turn regular lemonade into something really special for your event. The trick to having a just slightly alcoholic beverage, while also offering a non-alcoholic option that is just as special. Consider offering a fruit or herb infused water, or a sparkling water in an unusual vessel. It’s my general rule that no one NEEDS a gin martini at 3:30 in the afternoon, so offer well balanced cocktails and mocktails for the office. The goal isn’t to get drunk, the goal is to celebrate. If Sarah from IT doesn’t like to be the center of attention, don’t make her blow out the candles on her birthday cake in the front of the conference room while everyone stares at her. Just simply give her a simple, “On behalf of the company, we want to wish you a happy birthday!” Followed by an emphatic “Here! Here!” This will allow everyone to remain comfortable, yet still celebrate the motivation for the event. It is called a party after all. This goes back to being mindful of your guests. If your office needs help getting people to talk to each other, simple games can foster the conversation. If you’ve got really big personalities, utilize that! Or perphaps this celebration is a real brain break for the staff, so you’ll just want to let them mingle. They will thank you for it. Lastly, make sure your admin staff gets to eat at these things. Sometimes the admins are too busy hosting the event to even taste the hors d’oeurves they spent hours considering. What tips and tricks have you picked up in hosting office events? I started this job a few months ago, and everyone kept talking about this blog, ”Snack O’Clock.” I thought to myself, “I LOVE SNACKS, this is perfect!” I was a little disappointed so see so few posts on actual snacks. I mean, it is called Snack O’Clock. Then JP approached me to write a blog post about one of my cakes. And I thought, “this is awesome”! I’ve been thinking a lot about blogging, technology, baking and how they all fit together in my new role as First Impressions Officer here at Matrix Group. As a proud Millennial, I’ve blogged for most of my opinionated adolescence, (Shout out to all the Live Journal users out there!) so I’ll keep the angst to a minimum here. I have also become an avid baker/pastry chef in the past few years. I love trying new things in the kitchen, and, above all else, I am a huge fan of eating. Not in a gluttonous, frenzied way, but in a savoring experience of flavors, textures, and ideas. Food is nourishment for the body, and for the mind. 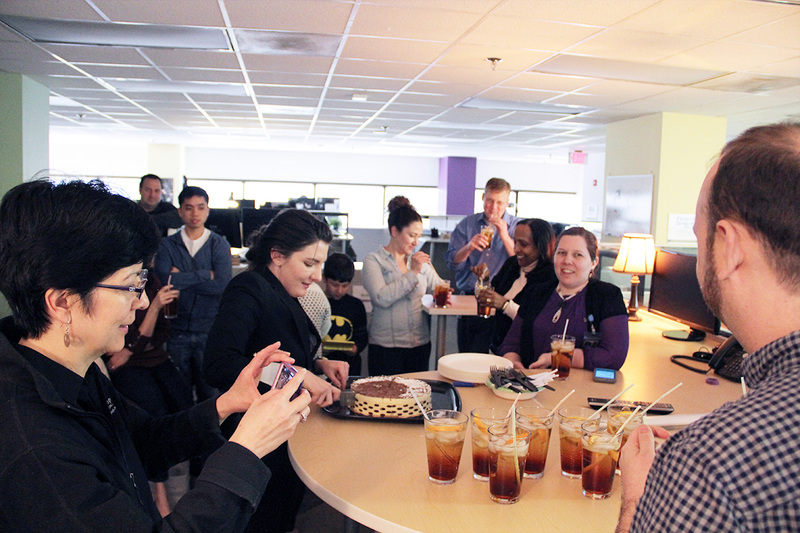 Last week, we put together an office party to celebrate those who had birthdays in January. I was tasked with the party planning. I asked those with birthdays what kind of cakes they wanted as part of the celebration. There was a request for a banal red velvet cake, then a more adventurous chocolate and mint flavored grasshopper cake. And then something amazing happened. Elaine asked for a dessert either gluten-free or under the Paleo diet umbrella. I accepted the challenge, dusted off my trusty Google search engine, and went to task. I learned that the followers of the Paleo lifestyle diet focus more on fruits, vegetables, nuts, and lean proteins. More of what our Paleolithic ancestors would have eaten. The focus is on nutrient rich eating, real food, and natural foods. I found the answer in the most feminine and beautiful niche blogs. The Urban Poser is a delightful baking blog with amazing recipes which all fall under this Paleo umbrella. Her “Cherry Chocolate Naked Cake” was so striking that I absolutely needed to make it. Immediately. The basics of this cake were some kind of fat (palm shortening or ghee), the coconut flour, a binding natural starch flour like arrowroot or potato, cocoa powder, coconut milk, eggs, and honey. I was SO SURPRISED to find that when the cakes were finished baking they looked, smelled, and tasted like cake! Not some weird crumbly mess I’ve made of vegan variety, but honest to goodness cake. This was like having a decadent piece of chocolate cake without that saccharine punch in the teeth. I did, however, have issue with the recommended whipped coconut cream frosting. Once I added the recommended amount of cocoa powder, the cream seized up making it look a little less than appealing. 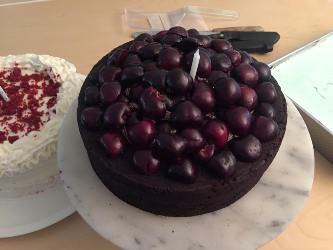 The next instructions detailed how to cover the cake in halved ripe cherries saving the cake from some kind of aesthetic failure. This cake was what we call in my house slammin’ jammin’. This cake was a hit in the office, and a hit with the resident Paleo follower. It’s easy to reject new things because they take you out of your comfort zone. It’s even easier to buy cakes ready made from the supermarket. However, it is most important to live fully. Or with a full belly. To see the full recipe and fall in love, visit the Urban Poser’s blog. You really need to try this cake for yourself! What new challenges have you taken on in 2017?